Born 1908 (d. 1993) lived in Marshfield, North Carolina. The innocence portrayed by the "little people" carved by J.B. Bailey is continually refreshing. Bailey lived in North Carolina. We learned while reading the book "Signs and Wonders: Outsider Art Inside North Carolina" titled after the exhibition of the same name, that "Bright" learned skills he later used in his carving from his father who was a carpenter and contractor.He began carving after he retired at the age of 59, according to Betty-Carol Sellen's "Self-Taught, Outsider, and Folk Art". He suffered from asbestosis after years of work place exposure. During a period of around fifteen years of carving before his health deteriorated further, he reportedly carved hundreds of pieces. His sculpture also included miniature furniture and trucks in addition to his figural sculpture. The human figures were said to have depicted "friends and acquaintances." The work was personal, he displayed it in the house in which he lived and his wife lived beyond his passing. 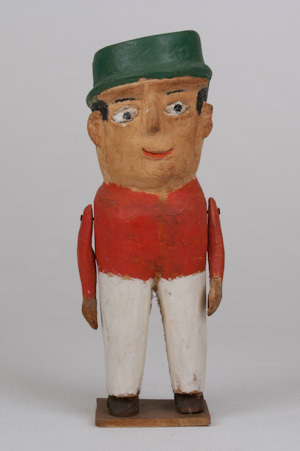 His work was represented in commercial galleries and exhibited in the show "Worth Keeping" in addition to the unforgettable "Signs and Wonders." We were captivated by the personality of the robust little man we bought in 1988 from Art Jones at his gallery. We were told that he had gotten the piece from Larry Hackley for consignment. We purchased him on the same day as our first Edd Lambdin monkey. The expression on his face was so unadulterated, somewhat cartoon-like. 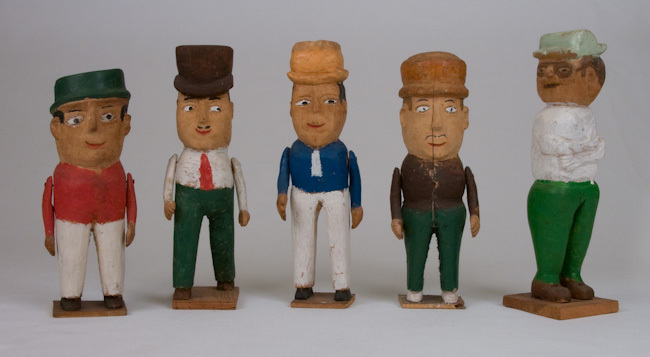 We had the opportunity to purchase several more of his delightful figures years later, in 1994, at the auction of Howard Smith's Outsider Art Collection presented by Kimball Sterling in Johnson City, Tennessee. All are "signed" with his address "J.B. Bailey Rt. 4, Marshfield, N.C." We display them as a group, we assume that perhaps they were all acquainted at some point in time. We later heard stories about some of Bailey's work being stolen from shelves located on the porch of his and his wife's home. We were somewhat relieved given the provenance of the pieces work in our collection. We hope they were only rumors.